I had hoped to have done another blog post well before now, but for several weeks I didn’t get to do any stitching and have only picked it up again recently. We had an unexpected trip back to Dubai, which was really lovely. Colin had business to do at the office and it was good to be able to check over the apartment. We flew out on our 35th wedding anniversary and celebrated at Heathrow airport with champagne and food at the Seafood and Caviar Bar. On landing at Dubai early in the morning we checked into a hotel for the rest of the day and an overnight stay before going on to the apartment. Several days after returning to the UK I came down with a really bad chest and cough and felt very unwell for a couple of weeks and as much as I longed to stitch I didn’t feel well enough. I have now finally finished stitching the house on Home of a Needleworker (Too). 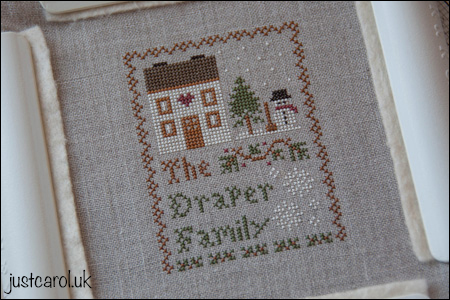 It seems to have taken ages so I’m happy to see that part finished. I’ll be putting this aside for a little while so that I can catch up on a couple of new starts since my last post. Both are for Matthew son number two. This is Labyrinth - A Magic Dance, an instant download chart from Cloudsfactory. My second new start is a mini cushion by Sheena Rogers Designs. 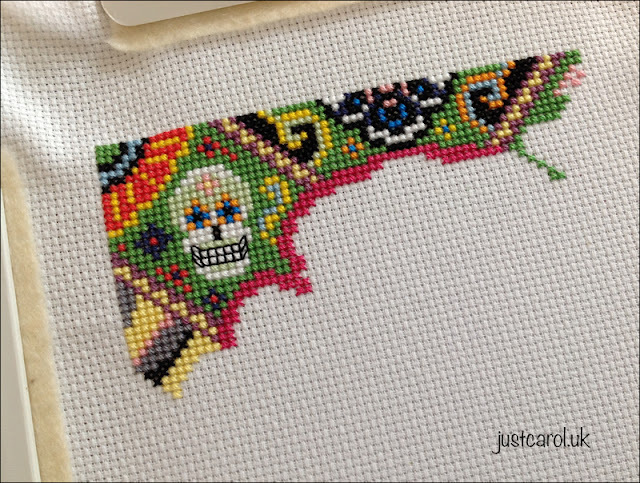 I’ve always wanted to stitch one of these mini cushions and thought Sugar Skulls would be perfect for Matthew as he has recently celebrated his 30th birthday in Mexico, and spent the day of his birthday at the festival of the Day of the Dead. Really enjoying watching this grow. 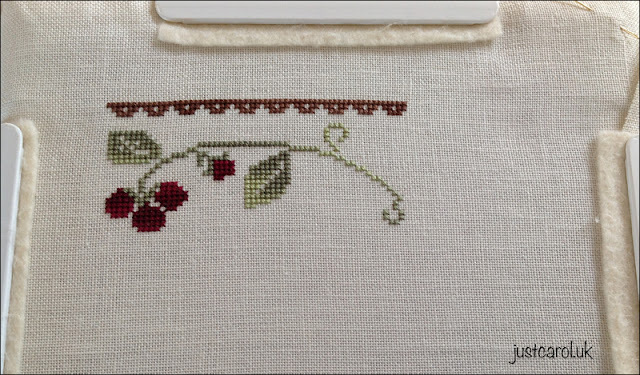 I’m stitching it on the Aida that came in the kit. 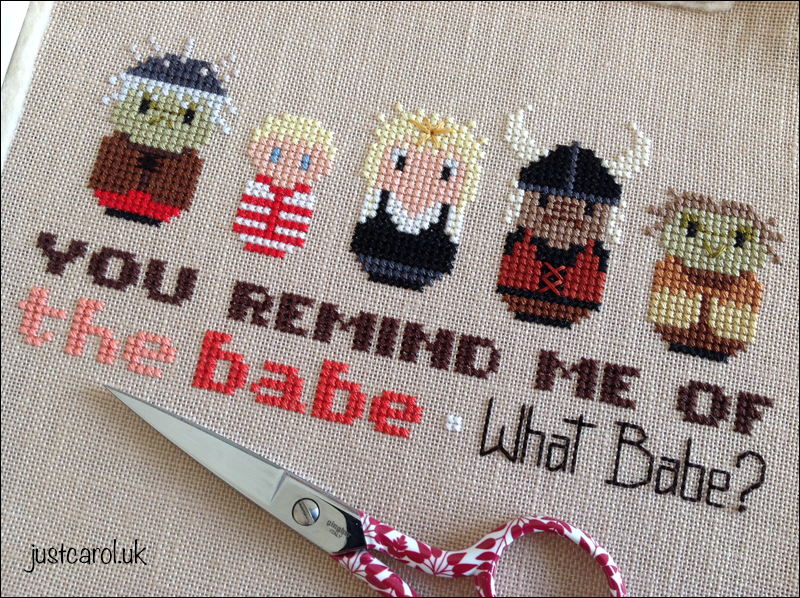 I never stitch on Aida but as the design is full coverage I thought I would use it. 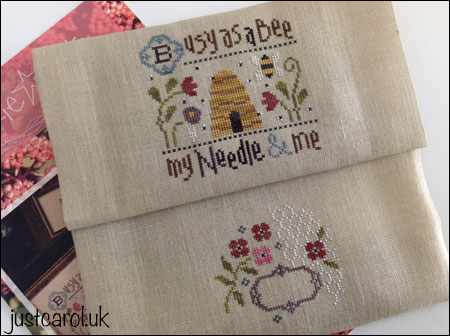 I won’t be stitching at all next week as Colin and I will be in London. While there we will be meeting up with our two boys and daughter-in-law Nic to have a belated birthday meal for Matthew’s 30th. Very excited about that as it’s been a year since the last time we were all together at the same time. 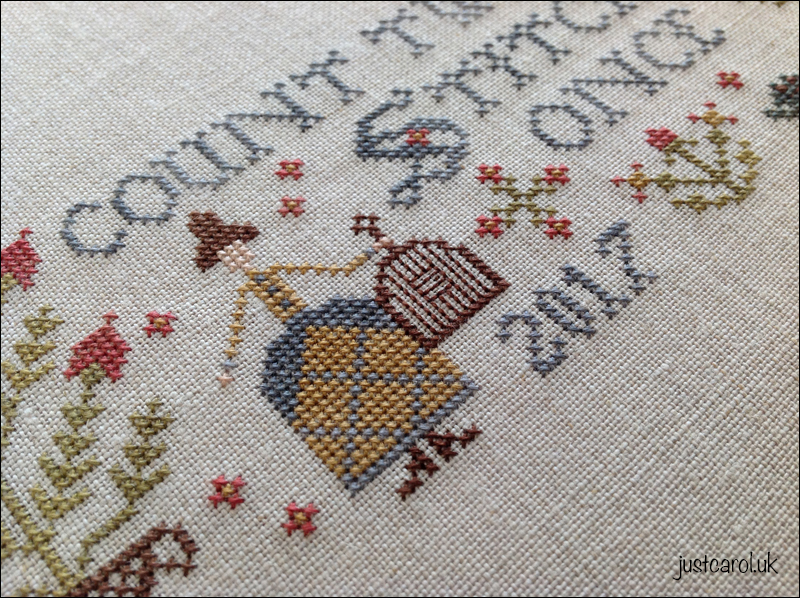 I’ve finished my Count Twice by Plum Street Samplers. This was a must have bought as soon as it was released. 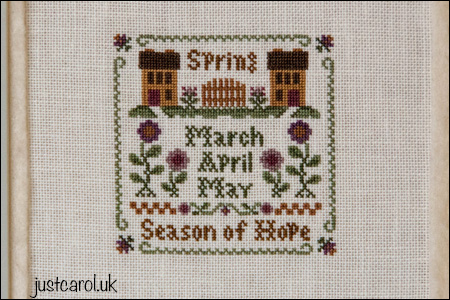 So pleased that I’ve finally got round to stitching it. The CC River Rocks for the wording and the lady’s dress looked a little too grey for my liking, so I substituted it for CC Milady’s Teal and stitched it over two on 40ct Newcastle Flax. In real life it now looks just like the model on the chart which is what i wanted. I will one day have this piece framed. I’ve also made a little start on Home of a Needleworker (Too!) 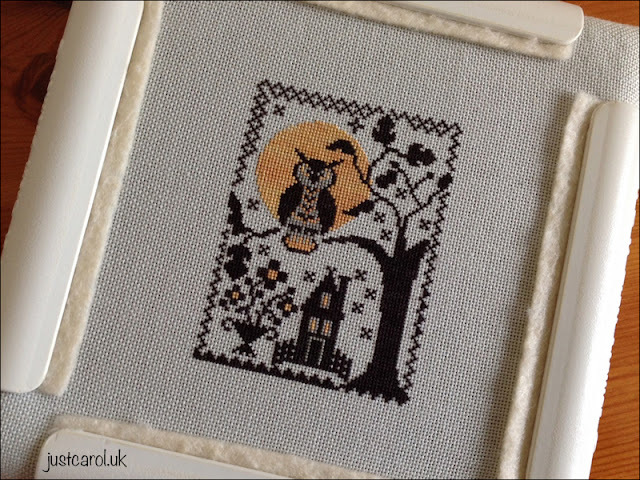 by Little House Needleworks. This has been on my to do list for a long time. The fabric I’m stitching it on is 32ct Belfast Platinum. I’m making the most of purchasing new charts while I'm back in the UK. 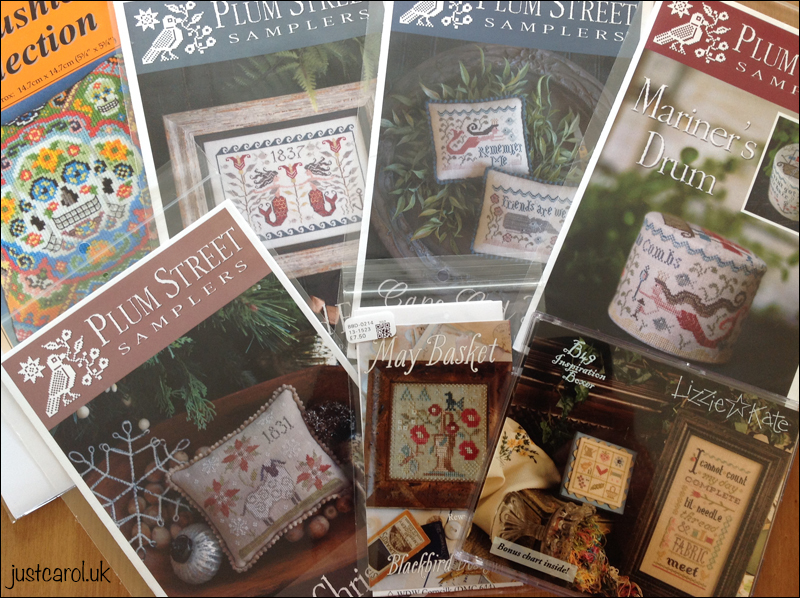 Can you tell I’m a big fan of Plum Street Samplers, and mermaids. I’ve also purchased Needlework ABCs by Little House Needleworks. I took it back to Dubai last month when we had to make a flying visit, and wishing now that I hadn’t left it there! Thank you so much for your comments on my last post - I was so happy to see that I hadn’t been forgotten. 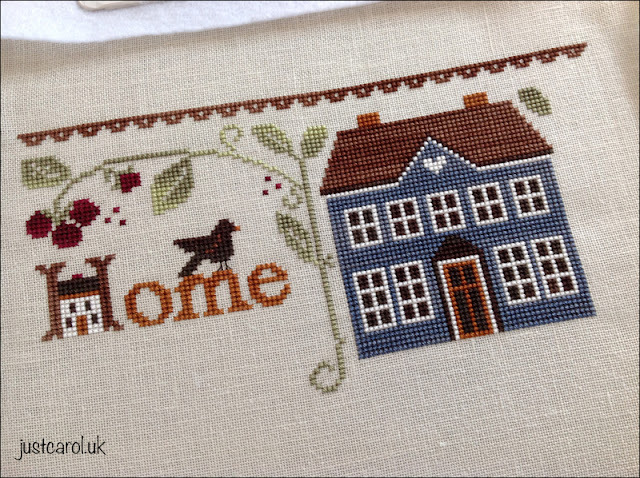 Hope to post again soon with an update on Home of a Needleworker. I’m planning on a couple of new starts too, so may be able to post progress pics on those. I can’t believe that it’s been almost three years since my last post - how bad is that! 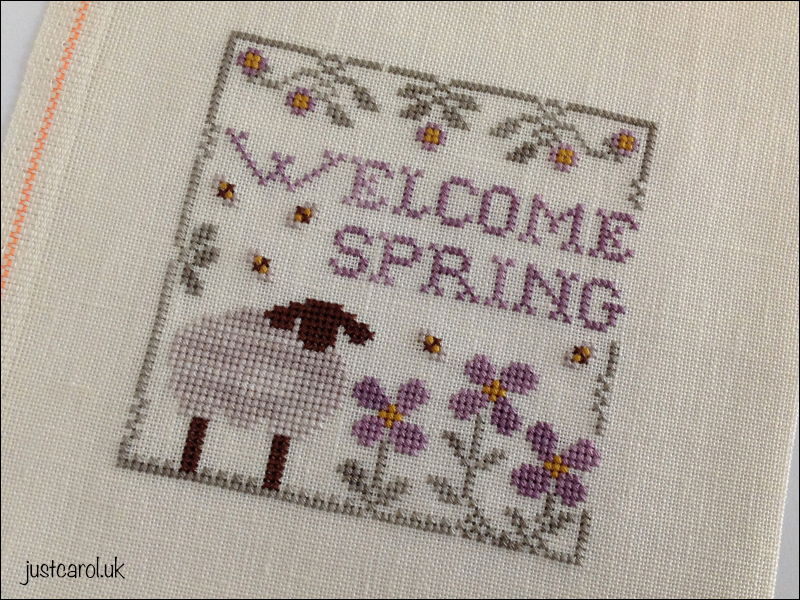 I've still been stitching a little from time to time but have lost my finishing mojo which is why I've not been blogging. 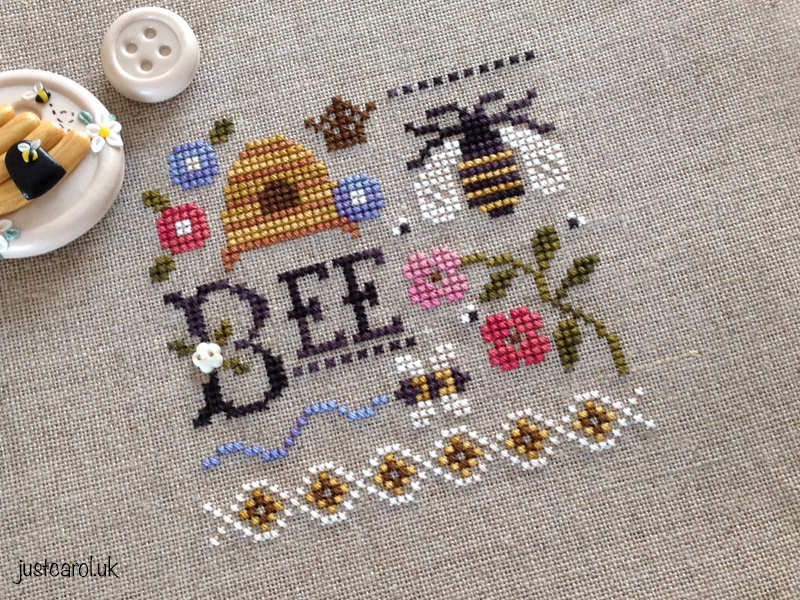 I've only ever really blogged when I’ve had a piece stitched and made into something to share. I'm back in the UK now for several months and all my stash and finishing supplies are home in Dubai, so until I return I doubt very much that my finishing mojo will too. I have on my MacBook with me pics of just a few of the pieces I’ve stitched since my last post, and although they've not yet been made up I thought for now I could share these as I really would like to get back into blogging again. 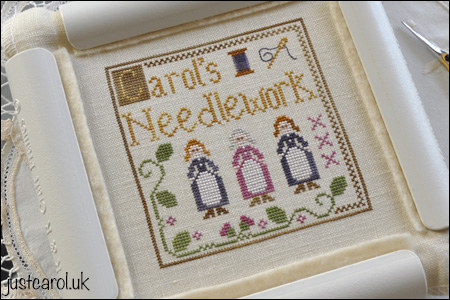 If any of the ladies from the Needlecraft Haven group see this post they may recognise some of these pieces, as many of them where stitched when I joined the ladies for parlour night stitching and took pics to share on the group. This first piece is actually completely finished, but that's only because it went to the framers. I stitched this for my daughter-in-law Nic sister’s first baby. I gave Jason and Nic a choice of designs and they chose Oh Baby! by Lizzie Kate. 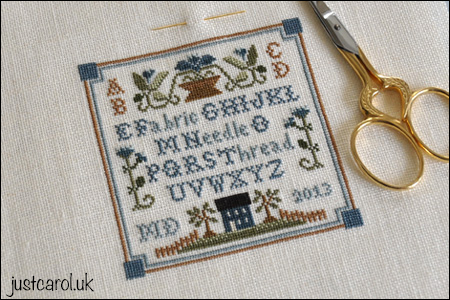 The chart comes with several baby motifs to choose from to personalise the sampler. 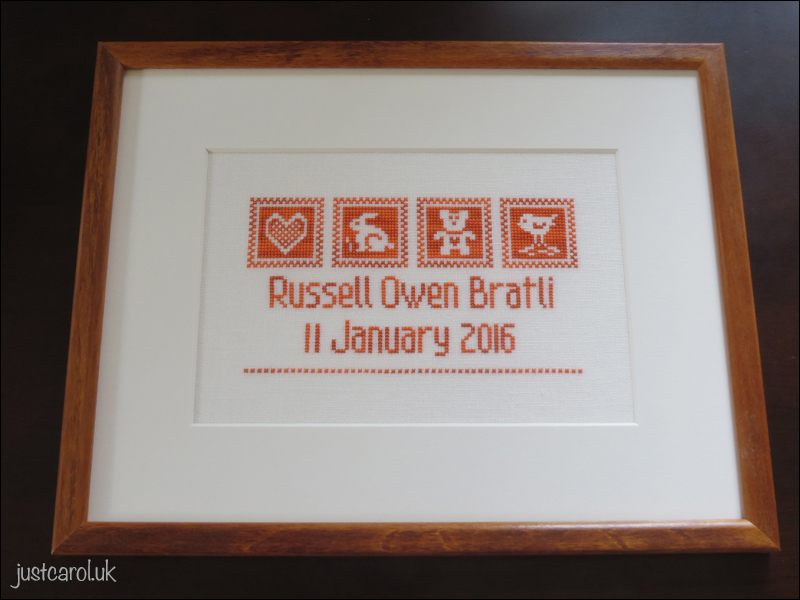 Jase and Nic chose which motifs they would like to have stitched and also the WDW Pumpkin thread (new Mum’s favourite colour is orange). Lizzie Kate - Oh Baby! I'm not sure if I can remember all the fabric and threads I've used for the following, but will list what I can. 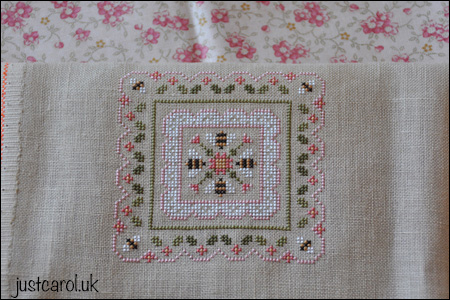 30ct Natural Linen and little white flower button were included in the kit. 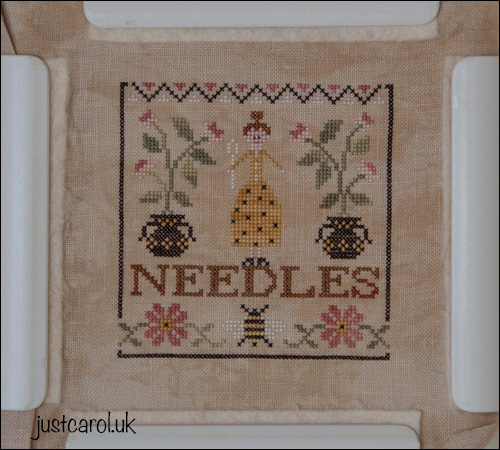 Just had to take a close up pic of my new needle nanny from Pedros Plaques, which you can see a little of in the previous pic. It’s just the cutest thing - I love it! 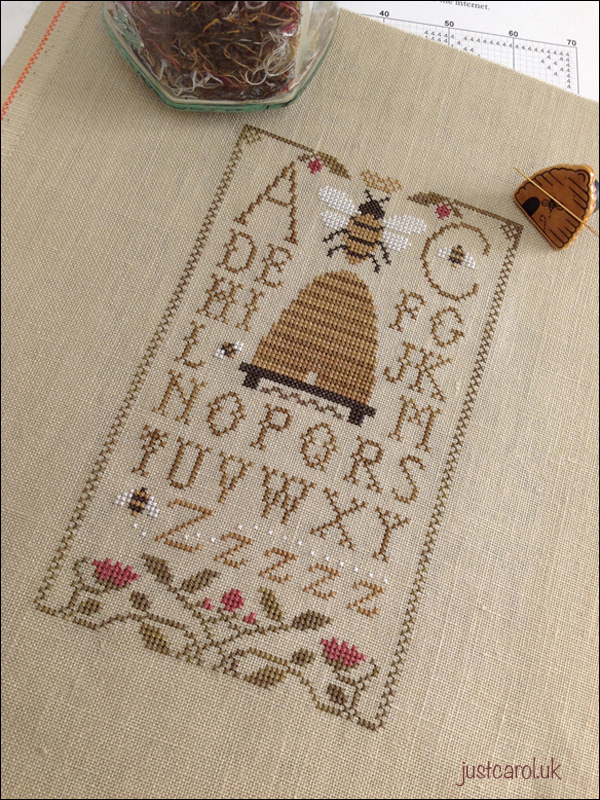 Substituted DMC 746 for DMC 3865 so that the bees wings would show up more on the fabric. 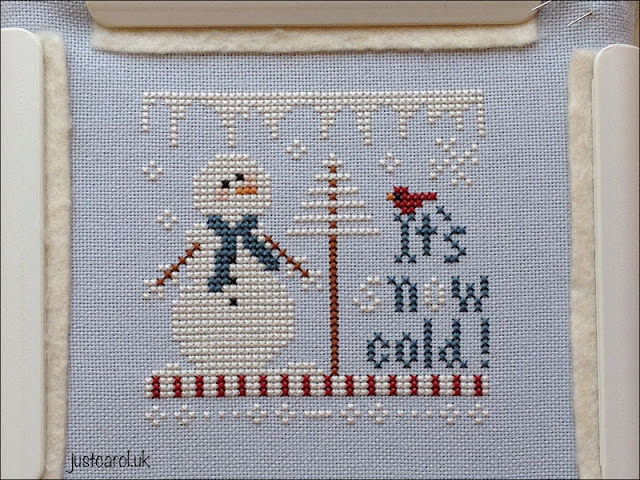 Stitched with Classic Colorworks thread pack that came with chart. Have now personalised the pin pillow design with my initials but don’t have a pic of that yet. 32ct fabric that I have had in my stash for years but can’t remember what it is. 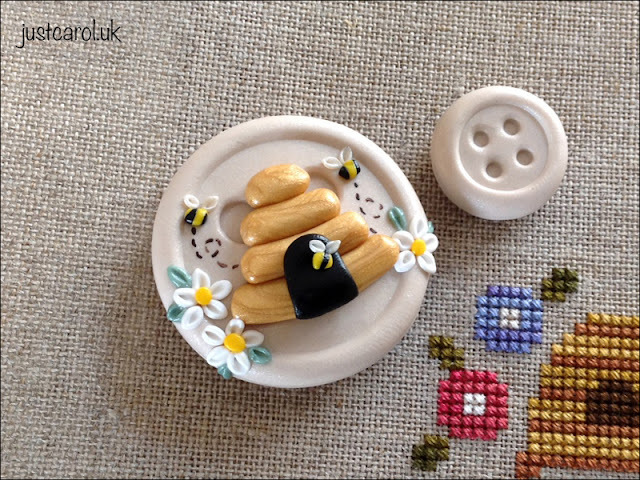 Had bought the two yellow flower buttons for the pots, but couldn’t use them as they were too big having stitched on 40ct instead of the listed 20ct Cork linen. I added a little extra yellow stitching to the pots instead. One over one on 32ct Belfast Cream I think. Replaced Attic with my name. I have several more pieces in Dubai waiting to be made up which I will share once I eventually make a start on them. Really miss having all my stash here, especially as I have bought several new charts which I know I have fabric and threads for in Dubai that I could use to kit them up with and start stitching. I did bring several projects back to the UK with me, so I do have some stitching to be going on with. 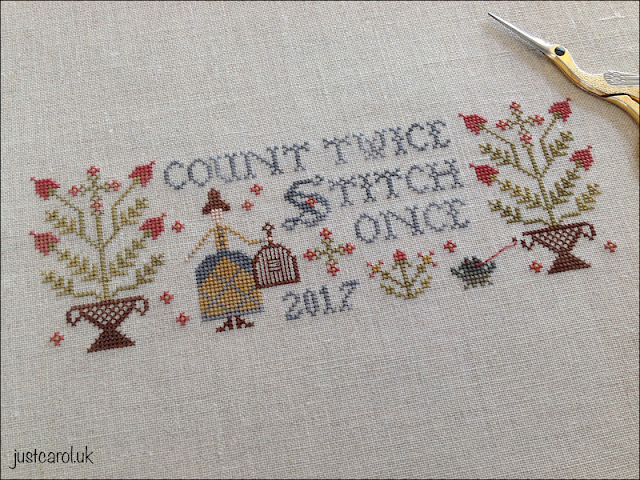 Have almost finished stitching Count Twice by Plum Street Samplers, so will be back again soon to post a piccie of that one. Thank you for visiting, especially as it really has been such a long time since my last post.